A broad range of scheduled clinics at the Breast Centre cater for all aspects of breast disease including multidisciplinary breast cancer care, high risk clinics, benign breast clinic, follow up clinics, clinical psychology clinic, and others. Several times per week, specialists from all disciplines involved in treating patients meet to develop an individualised and agreed care plan for patients undergoing cancer treatment. All options for treatment and ongoing care are discussed and explained to the patients to enable an informed decision by the patient. The final plan is only decided in close consultation with patients and their families or carers. 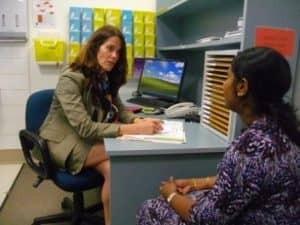 The Westmead Breast Centre is unique in being able to provide for all the needs of patients with a breast complaint from initial investigations to multidisciplinary care, supportive and educational needs as well as state of the art equipment and facilities. With over 20 years of experience, this has culminated in a great deal of expertise in a single location that will continue to benefit patients today and every day. The Westmead Breast Cancer Institute offers a range of support services to patients and their carers. Check our Support Services page for details of services available and upcoming events. An extensive selection of information brochures are available covering a wide range of topics associated with breast cancer. Check the Information Brochures page for more details.